St. Francis of Assisi - My Catholic Life! Though originally baptized by his mother as Giovanni (John) in honor of Saint John the Baptist, he was renamed Francesco, or “Frenchy,” in honor of France, by his father Pietro de Bernardone, when Pietro returned home from trading in that country. Pietro loved France, and his son’s romantic, troubadour spirit likely flowed from that same cultural source. Francesco grew up in a middle-class home that engaged in the sale of fine cloth. Francis was a skilled merchant in the family business, but he enjoyed spending money more than earning it. He was a man about town, a leader among his friends, and well liked for his concern for others. He was also a failed knight. When he was twenty, Francis joined a civic-minded Assisi militia in a battle against a neighboring city. When the militia was routed, Francis was spared death and instead held for ransom due to his fine livery. He was held prisoner in a rank dungeon for a year before the ransom was paid. He returned to Assisi a more reflective man. Subsequent military service for the Papal States ended abruptly when Francis heard a voice tell him, “Follow the master rather than the man.” He sold his expensive armor and horse, returned home, and began to spend hours in prayer. Shortly after this turning point, Francis met a leper on the outskirts of Assisi. He initially recoiled, but then dismounted, gave the man some money, and kissed his putrid hand. This was the start of his frequent visits to leper houses and hospitals. When Francis heard a voice from the cross say to him, “Francis, go and repair my church, which as you can see is in ruins,” he sold a large amount of his father’s cloth and his father’s horse at a neighboring market town. Coming back to Assisi, he donated the proceeds to a priest at the church of San Damiano on the outskirts of Assisi. Francis’ father was irate. His son had sold cloth from the family store, and a horse, and had then given away money that was not his. This was stealing, and Francis was put in prison. A dramatic scene then unfolds between Francis and his father, in the presence of Bishop Guido of Assisi and his court seated in a church square. Pietro demands the return of his money, and the Bishop says the Church cannot accept stolen money. Francis returns the coins. But then Francis goes further. Piece by piece, he removes his clothing until he is naked before everyone’s eyes. He then says, “From now on I will not say ‘My Father, Pietro Bernardone’ but ‘Our Father, who art in heaven.’” There is not a single reference in any contemporary Franciscan document to Pietro after this dramatic incident. Francis was now cut off, disinherited, and on his own. Eventually, Francis begins to wear a rough smock which he ties around his waist with a cord. He lives alone in absolute poverty, prays, helps the sick, rebuilds nearby run-down chapels, and preaches and begs in Assisi. Men begin to follow his lead, and the first fire of the worldwide Franciscan order ignites. The “Lesser Brothers of Assisi” is recognized by the Pope, Francis is ordained a deacon, and the order’s explosive growth can only be called miraculous. 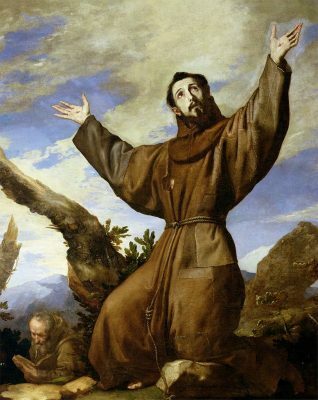 Saint Francis is the first great founder of a religious order since Saint Benedict in the 500s. By sheer allure of personality and holiness, not intellect, organizational skill, or vision, he imparted a mysteriously powerful charism to his followers. He was ardent in his love for the Holy Eucharist and insisted that churches be well kept in its honor. Francis died in his forty-fourth year and was canonized just two years later, in 1228. Saint Francis may be the most well known person of the second millennium. A measure of his massive impact on the Church can be gauged by observing that it is not uncommon for Saint Francis at times to be seen as the ideal of Christian virtue and poverty, even over the religion’s very founder. Saint Francis of Assisi, you held the Holy Eucharist in such holy reverence you dared not be ordained a priest. Your love of the Word of God complimented your love of His creation. Help all Christians to have your same balance of love for God, the Sacraments, and all God’s creation. ST. FRANCIS, the son of a merchant of Assisi, was born in that city in 1182. Chosen by God to be a living manifestation to the world of Christ’s poor and suffering life on earth, he was early inspired with a high esteem and burning love of poverty and humiliation. The thought of the Man of Sorrows, Who had not where to lay His head, filled him with holy envy of the poor, and constrained him to renounce the wealth and worldly station which he abhorred. The scorn and hard usage which he met with from his father and townsmen when he appeared among them in the garb of poverty were delightful to him. “Now,” he exclaimed, “I can say truly, ‘Our Father Who art in heaven. '” But divine love burned in him too mightily not to kindle like desires in other hearts. Many joined themselves to him, and were constituted by Pope Innocent III. into a religious Order, which spread rapidly throughout Christendom. St. Francis, after visiting the East in the vain quest of martyrdom, spent his life like his Divine Master — now in preaching to the multitudes, now amid desert solitudes in fasting and contemplation. During one of these retreats he received on his hands, feet, and side the print of the five bleeding wounds of Jesus. With the cry, “Welcome, sister Death,” he passed to the glory of his God October 4, 1226. Reflection.— “My God and my all,” St. Francis’ constant prayer, explains both his poverty and his wealth.